This pressure sensitive adhesive will bond to surface such as foam or plastic. Once the backing paper is removed, the adhesive transfers to the surface leaving an adhesive surface ready to be attached to whatever you want. 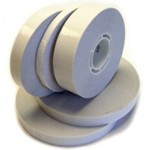 We recommend using this product with our 3M ATG 700 Transfer Adhesive Tape Gun which will accurately apply the tape and collect the used paper backing. See our shop for this product.